We use Drosophila to unveil the basic principles that govern cell proliferation and malignant growth. 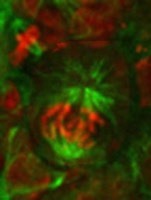 We focus on the mechanisms of malignant transformation in larval brains. We have found that neuroblasts can originate tumors if the delicately balanced process of self-renewing asymmetric division is disrupted. We develop and make extensive use of microscopy techniques. 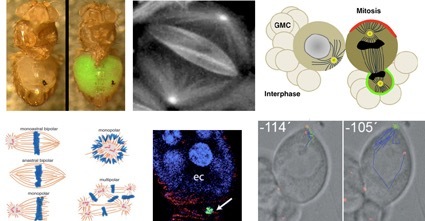 We have demonstrated that the microtubule cytoskeleton of Drosophila neuroblasts is governed by the distinct behaviour displayed by centrosomes in these cells. We also work on the mechanisms that bring about genome instability in Drosophila tumours and are trying to establish the actual extent to which such lesions contribute to tumour progression.